Python is a versatile programming language that can be used for many different programming projects. First published in 1991 with a name inspired by the British comedy group Monty Python, the development team wanted to make Python a language that was fun to use. Easy to set up, and written in a relatively straightforward style with immediate feedback on errors, Python is a great choice for beginners and experienced developers alike. Python 3 is the most current version of the language and is considered to be the future of Python. This tutorial will guide you through installing Python 3 on your local macOS machine and setting up a programming environment via the command line. You will need a macOS computer with administrative access that is connected to the internet. We’ll be completing most of our installation and set up on the command line, which is a non-graphical way to interact with your computer. That is, instead of clicking on buttons, you’ll be typing in text and receiving feedback from your computer through text as well. The command line, also known as a shell, can help you modify and automate many of the tasks you do on a computer every day, and is an essential tool for software developers. The macOS Terminal is an application you can use to access the command line interface. Like any other application, you can find it by going into Finder, navigating to the Applications folder, and then into the Utilities folder. From here, double-click the Terminal like any other application to open it up. Alternatively, you can use Spotlight by holding down the command and spacebar keys to find Terminal by typing it out in the box that appears. 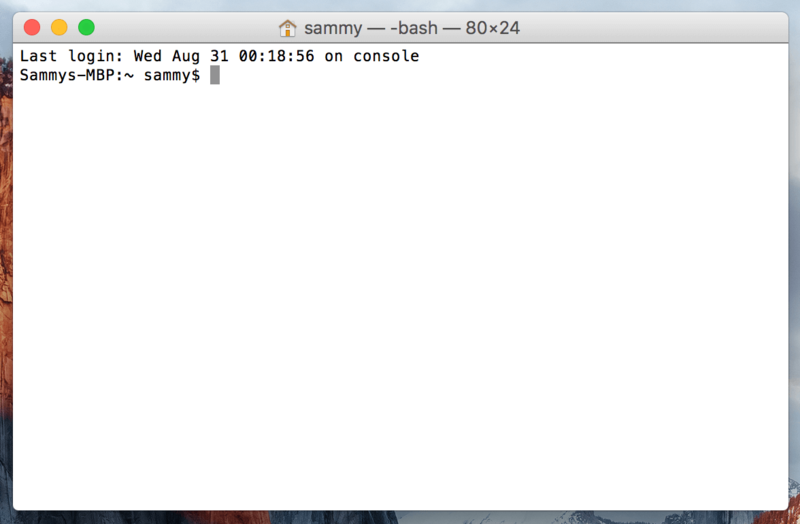 There are many more Terminal commands to learn that can enable you to do more powerful things. The article “An Introduction to the Linux Terminal” can get you better oriented with the Linux Terminal, which is similar to the macOS Terminal. If you received an error, then in your web browser install Xcode from the App Store and accept the default options. At this point, Xcode and its Command Line Tools app are fully installed, and we are ready to install the package manager Homebrew. While the OS X Terminal has a lot of the functionality of Linux Terminals and other Unix systems, it does not ship with a good package manager. A package manager is a collection of software tools that work to automate installation processes that include initial software installation, upgrading and configuring of software, and removing software as needed. They keep installations in a central location and can maintain all software packages on the system in formats that are commonly used. Homebrew provides OS X with a free and open source software package managing system that simplifies the installation of software on OS X.
Homebrew is made with Ruby, so it will be modifying your computer’s Ruby path. The curl command pulls a script from the specified URL. This script will explain what it will do and then pauses the process to prompt you to confirm. This provides you with a lot of feedback on what the script is going to be doing to your system and gives you the opportunity to verify the process. If you need to enter your password note that your keystrokes will not display in the Terminal window but they will be recorded, simply press the return key once you’ve entered your password. Otherwise press the letter y for “yes” whenever you are prompted to confirm the installation. The -f or --fail flag tells the Terminal window to give no HTML document output on server errors. The -s or --silent flag mutes curl so that it does not show the progress meter, and combined with the -S or --show-error flag it will ensure that curl shows an error message if it fails. The -L or --location flag will tell curl to redo the request to a new place if the server reports that the requested page has moved to a different location. Once the installation process is complete, we’ll put the Homebrew directory at the top of the PATH environment variable. This will ensure that Homebrew installations will be called over the tools that Mac OS X may select automatically that could run counter to the development environment we’re creating. To save your changes, hold down the control key and the letter o, and when prompted press the return key. Now you can exit nano by holding the control key and the letter x. Once you have done this, the changes you have made to the PATH environment variable will be effective. Otherwise, you may get a warning to run another command such as brew update to ensure that your installation of Homebrew is up to date. Once Homebrew is ready, you can install Python 3. The Terminal window will give you feedback regarding the installation process of Python 3, it may take a few minutes before installation is complete. Along with Python 3, Homebrew will install pip, setuptools and wheel. setuptools facilitates packaging Python projects, and wheel is a built-package format for Python that can speed up your software production by reducing the number of times you need to compile. This will output the specific version of Python that is currently installed, which will by default be the most up-to-date stable version of Python 3 that is available. It is good practice to ensure that your version of Python is up-to-date. Now that we have Xcode, Homebrew, and Python installed, we can go on to create our programming environment. Virtual environments enable you to have an isolated space on your computer for Python projects, ensuring that each of your projects can have its own set of dependencies that won’t disrupt any of your other projects. Setting up a programming environment provides us with greater control over our Python projects and over how different versions of packages are handled. This is especially important when working with third-party packages. You can set up as many Python programming environments as you would like. Each environment is basically a directory or folder in your computer that has a few scripts in it to make it act as an environment. The pyvenv.cfg file points to the Python installation that you used to run the command. The lib subdirectory contains a copy of the Python version and has a site-packages subdirectory inside it that starts out empty but will eventually hold the relevant third-party modules that you install. The include subdirectory compiles packages. The bin subdirectory has a copy of the Python binary along with the activate shell script that is used to set up the environment. Together, these files work to make sure that your projects are isolated from the broader context of your local machine, so that system files and project files don’t mix. This is good practice for version control and to ensure that each of your projects has access to the particular packages that it needs. This prefix lets us know that the environment my_env is currently active, meaning that when we create programs here they will use only this particular environment’s settings and packages. Note: Within the virtual environment, you can use the command python instead of python3, and pip instead of pip3 if you would prefer. If you use Python 3 on your machine outside of an environment, you’ll need to use the python3 and pip3 commands exclusively, as python and pip will call an earlier version of Python. After following these steps, your virtual environment is ready to use. Now that we have our virtual environment set up, let’s create a simple “Hello, World!” program. This will make sure that our environment is working and gives us the opportunity to become more familiar with Python if we aren’t already. Exit nano by typing the control and x keys, and when prompted to save the file press y. To leave the environment, simply type the command deactivate and you’ll return to your original directory. Congratulations! At this point you have a Python 3 programming environment set up on your local Mac OS X machine and can begin a coding project! To set up Python 3 on another computer, follow the local programming environment guides for Ubuntu 16.04, Debian 8, CentOS 7, or Windows 10. You can also read about installing Python and setting up a programming environment on an Ubuntu 16.04 server, which is especially useful when working on development teams. With your local machine ready for software development, you can continue to learn more about coding in Python by following “Understanding Data Types in Python 3” and “How To Use Variables in Python 3”. This tutorial series will guide you through installing Python 3 on your local machine and setting up a programming environment via the command line. Python is a versatile programming language that can be used for many different projects. This tutorial will get you up and running with a local Python 3 programming environment in Ubuntu 16.04. It will guide you through installing Python 3 on your local Linux machine and setting up a programming environment via the command line. Though it will explicitly cover the installation procedures for Ubuntu 16.04, the general principles apply to any other Debian-based distributions. This tutorial will get you up and running with a local Python 3 programming environment in Debian 8. Python is a versatile programming language that can be used for many different projects. First published in 1991 with a name inspired by the British comedy group Monty Python, the development team wanted to make Python a language that was fun to use. This tutorial will guide you through installing Python 3 on your local CentOS 7 machine and setting up a programming environment via the command line. Python is a versatile programming language that can be used for many different projects. This tutorial will guide you through installing Python 3 on your local macOS computer and setting up a programming environment on the command line with Terminal. Python is a versatile programming language that can be used for many different programming projects. This tutorial will guide you through installing Python 3 on your local Windows 10 computer and setting up a programming environment on the command line with PowerShell. Python is a versatile programming language that can be used for many different projects.